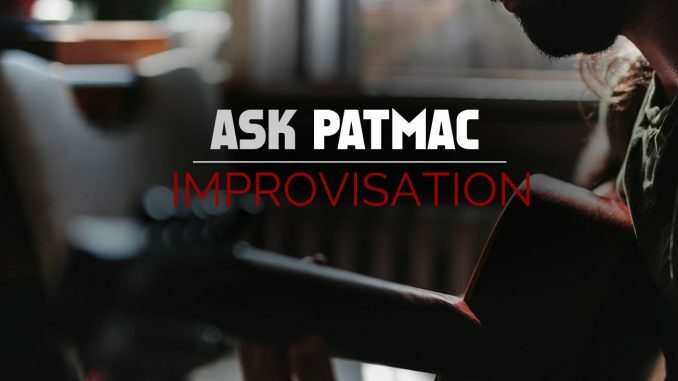 HomeBlogAsk PatmacAP-010 How do I select scales for guitar solos? … Something I don’t understand is, for example, say a simple 3 chord song such as Can’t You See by Marshall Tucker is D-C-G. If I were to make my own solo up to that song, rather than the one off the recording, would I play the licks in the D scale for a few seconds then change to a C scale as soon as the chord changes from D to C? And then when it changes to G would I again change the scale to a G scale? I hope my question makes some sort of sense. Thank you again. This is a great question and a common problem. If you look around the web, everyone says that Can’t You See is in the key of D, but it really isn’t. It’s in the key of G, and that will guide our soloing options. This might blow your mind since the song starts and ends on a D chord. The difference is only one note (C vs C#). The key of D has a C#. The key of G has a C. Since, C major is one of the chords, the C# will clash. Another clue is that D7 is played, which includes a C not a C#! Regardless, the fact that the song starts and ends with a D implies that your soloing should probably be somewhat centered on D. Let’s take a look at the soloing options that fit the key (and some will focus on D)! When you play one scale, you want to match the key. Since it is the key of G, you can play a G major scale (or G major pentatonic) over the whole song without any clashing notes. If you want to think in terms of D, which is probably good for this song, play the D mixolydian mode. It uses the same notes as G major, but you are rooted on D. The only difference between D mixolydian and D major is (You guessed it!) a C! 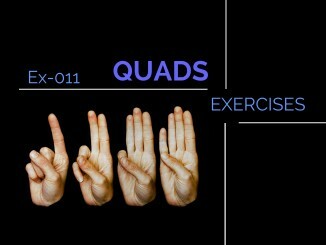 You can learn about all the modes, including mixolydian in my lesson on Modes. 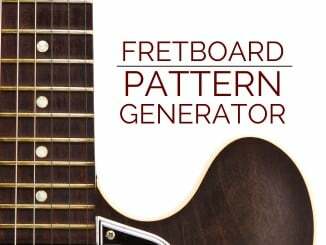 Play the major or major pentatonic scale based on the chord root. In other words, play D major over D, C major over C, and G major over G. That works perfectly too. The benefit of this approach is that the root, 3rd, and 5th notes of the major scale are the 3 notes of the major chord. C major chords consist of C E G. The C major scale is C D E F G A B. You still find C E and G inside the G major scale, but it’s a harder to remember that it’s the 4th, 6th, and root note. G A B C D E F#. Shifting the root helps you change one thing and use the same pattern to recognize the chord tones. Use a chord tone approach by playing notes in the chord. This isn’t much different than Option 2 except you’re limiting yourself to the chord tones. I like to teach people to learn the chord – scale relationship so they can switch back and forth. 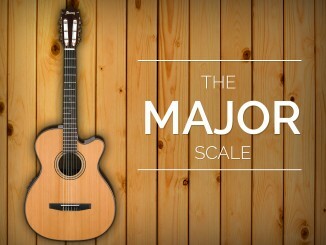 Choosing a scale is all about matching the notes to the chords. In general you don’t want any notes in a scale that are a half step from the chord being played. Pentatonic scales are great because they omit notes. The D major pentatonic scale omits the C# that is dissonant over the C major chord, so it is a perfect fit and might be the best scale to use on this song! You can also play D minor pentatonic with one caveat. You will want to the bend the F (out-of-key note) to an F# (in-key note). This will create a bluesy sound that should fit well in this song. There are a lot of ways to solo, but most of it comes down to playing in-key notes. I explained a few methods of finding scales with in-key notes. The first step is usually to identify the key! If you want to learn more (and support Guitar Lesson World), pick up a copy of Guitar Lesson World The Book, which includes all of these concepts and more!